The purpose of this page is to inform Christians about brothers and sisters in Christ who are suffering daily for their faith in Christ and to suggest ways in which we can help them from our means, our prayers and encouragement. Below you can find links to many organisations supporting Christians suffering all over the world. Just click on an image or name to go to a site. Aleteia is a worldwide Catholic network sharing faith resources for those seeking Truth. There are 1.2 billion Catholics in the world, and more than 2 billion Christians. By uniting our forces we will be able to represent a significant international voice online, in the global cultural panaorama. Aleteia is a project of the Foundation for Evangelization through the Media (fem-roma.org). is an inter-denominational Christian ministry working in various countries throughout Asia to see effective churches planted among unreached people groups. We work alongside Asian church leaders, helping and equipping them to focus on reaching the lost. Asian Harvest is also actively engaged in supporting many pastors now disabled by persecution. Barnabas Fund was established in 1993 with the aim of providing practical help to Christians in Muslim environments. Since that time our ministry has grown and we now bring hope and aid to the persecuted Church in over 50 countries. PRAYER FOCUS UPDATE is a monthly information bulletin with up-to-date news on the persecuted Church to help Christians pray for their suffering brothers and sisters. You can use this for prayer groups, your own information and for inclusion in church magazines. China Aid Association is a window into China. Through it, the world is able to witness the oppression, imprisonment and torture of Christians. In addition, CAA ministers to the suffering Church through prayer, education and training, financial support and intervention. Christian Persecution Info is published by Worthy Ministries which since 1999 continues to provide specific vital information to better equip believers for strategic intercession throughout the world. We are particularly concerned and focused on delivering reports from nations where persecution of Christians is occurring, and will continue to expand our coverage with a view toward encouraging effective prayer from the rest of the Body. Christian Solidarity Worldwide is a human rights organisation, independent of any government or political persuasion, which works on behalf of those suffering for their Christian beliefs and promotes religious liberty for all. As an advocacy organisation, CSW aims to influence governments and other bodies on religious freedom issues to ensure that the voice of the persecuted is heard in the international arena. Compass Direct is a Christian news service dedicated to providing exclusive news, penetrating reports, moving interviews and insightful analyses of situations and events facing Christians persecuted for their faith. Open Doors began in 1955 when God called a young Dutchman to act on the basis of Revelation 3:2: “Wake up! Strengthen what remains and is about to die.” He went to Poland and discovered a Church under threat behind the Iron Curtain, and desperately longing for the Word of God. Please click image above to see “Coming for Me”. 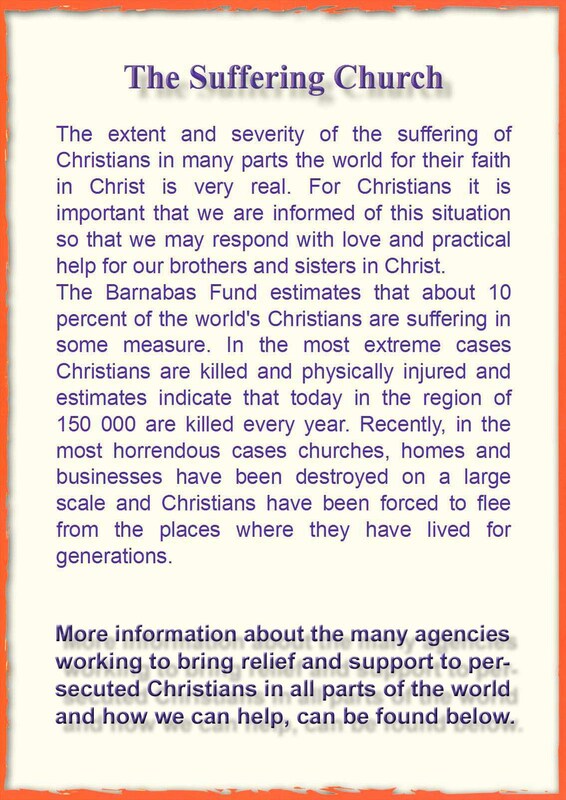 Please click on these images below to find out what you can do to help suffering Christians. Plateau State in Nigeria has long been home to many Christians… but increasingly they feel they are no longer welcome. They see Jos (the capital city) and the surrounding area as being under a carefully planned siege designed by Islamic extremists to bring Plateau State into line with the twelve northern states that have embraced Sharia (Islamic law). Located in Nigeria’s central region between the Muslim-majority north and the largely Christian south, Plateau State has seen decades of migration of the mainly cattle-herding Hausa and Fulani Muslims of the Sahel southwards into areas farmed by tribes that are largely Christian. When North Koreans cross the Tumen River where it is shallow or frozen to reach China, this does not mean freedom; China has an agreement with North Korea to forcibly repatriate all refugees. Since leaving North Korea is a capital offence, China’s policy potentially means sending refugees to their death. In North Korea returned refugees are brutally interrogated; if they admit to attending a church or having contact with religious organisations doing humanitarian work in the border area, they will be severely punished, even executed. North Korea is still the most difficult place in the world to be Christian. All religious activity is seen as a revolt against North Korea’s socialist principles and the cult of Kim Jong-il and his father. As a result of strict searches, considerable numbers of secret Christians have been discovered, arrested, tortured, and sometimes killed. Despite this, and the lack of freedom to worship, many take the risk of sharing their faith and the church is growing: there are an estimated 400,000 believers. Christian Concern is non-denominational and supports all Christians who affirm the Apostle’s Creed and believe that the Bible is the inspired Word of God. This includes Protestants, Catholics, and Eastern Orthodox believers. is a non-profit, interdenominational organization with a vision for aiding Christians around the world who are being persecuted for their faith in Christ. Persecution Blog is a useful source of recent news of our suffering brothers and sisters in Christ around the world.